Trai Turner has signed a four-year extension to remain with the Carolina Panthers, the team announced Friday. Trai Turner posted a PFF grade of 87.4 in 2015, ranking fifth in the NFL before a slump in play last year which was compounded by having to play some games at right tackle as injuries struck along the Panthers offensive line. 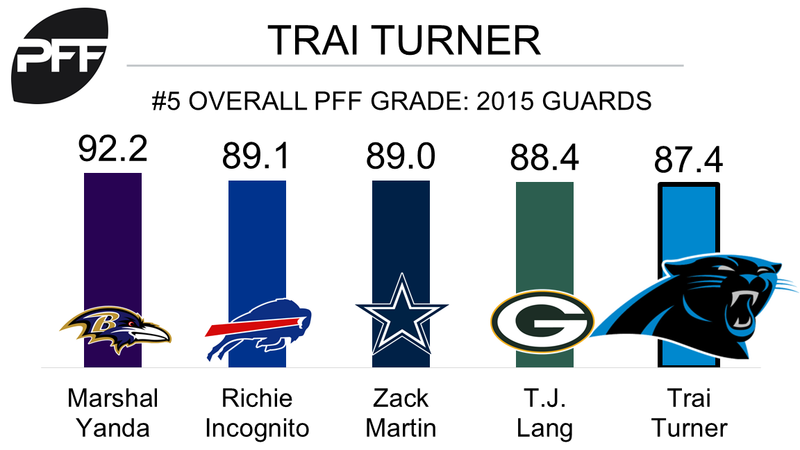 Turner’s three starts at right tackle accounted for three of his five worst-graded games of the season. He had ten total pressures surrendered as well as four penalties at right tackle. In 2015, Turner had the league’s seventh-best pass blocking efficiency score of 97.7, surrendering only 17 total pressures during the regular season, with only four additional hurries coming across three post-season games.